Closed the last tab accidentally? 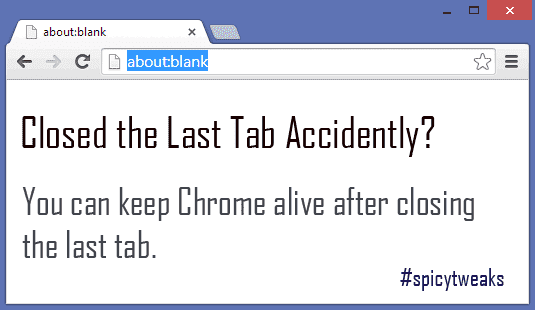 Last Tab Standing can prevent Google Chrome from exiting when you close the last left tab. Google Chrome is definitely one of the fastest web browser. But every browser isn't perfect. There are many annoying things in Chrome like high memory usage, CPU usage etc. Sometimes good features for some may be annoying to others. For example when you close the last tab, the browser will shut down automatically. Google probably does this to improve user experience but it's is annoying when you accidentally close the last tab. Users who wants to close the last tab will first need to open a new tab than close the other unnecessary tabs. Can we keep the browser open after closing the last tab? Yes! There are many extensions which does this very well. Last Tab Standing can be useful extension if you're annoyed with this Chrome feature. The extension opens a new tab page when you close the last left tab. Developers says this extension doesn't read any page data. It request access to tabs, so it can open and close the tabs as needed. This extension will not keep the window open if you close the built-in pages such as new tab, extensions, apps, and others. I don't see any problem on exiting of Chrome after closing an empty tab or new tab page. Instead, I like that because it lets's me easily close the Chrome. Need this extension? Follow these steps to get this extension and prevent Google Chrome from exiting after closing the last tab. Download and install the extension from here. Restart Google Chrome (it is important). If you accidentally closed a tab or window, you can easily recover it by pressing CTRL+SHIFT+T (On Mac, press ⌘+SHIFT+T). It will open the last closed window. Tip: If your Chrome web browser is slow than read some tips to improve Google Chrome performance. After installing this extension you'll not regret on closing the last left tab. This extension does the job it is made for quite well, but it has some issues which should know. If you have only one tab open than refreshing or clicking links might cause a tab to flash open for a second. If you don't mind this small issue, it is perfect solution to your problem.